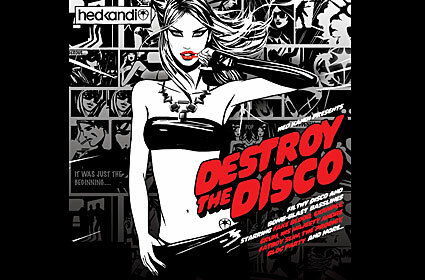 This brand new compilation is all about the deconstruction of the traditional disco sound by non other than Hed Kandi. It has been cut up, filtered, dirtily dub-ified, bolstered by bomb-blast basslines, and repackaged as something twitchier, edgier, and shockingly filthy. The first cd features Gossip, Bloc Party, The Prodigy, and Fatboy Slim. The second Grum, The Young Punx, Simian Mobile Disco, and Sebastian Ingrosso. As we've come to expect with Hed Kandi the album artwork is special too. It introduces a new noir alter-ego comic strip landscape where the (anti) heroine journeys into an entirely new territory. The package even includes a pull-out comic strip drawn by Jason Brooks. If you are looking for something fresh, new, and exciting from Hed Kandi this is it - beware!